The Prodigal God by Timothy J Keller looks at both sides of the parable of the Prodigal Son and its relevance in today's world. Want to get back to Christianity's heart? Keller argues that the parable of the prodigal son, while Jesus' best-known parable, is also his least understood. He introduces the reader to all the characters in this timeless story, showing that it concerns not just a wayward son, but also a judgemental older brother and, most importantly, a loving father. This short but powerful book is a reminder to the faithful, an explanation to the seeker, and finally an invitation to all -- both older and younger brothers -- to enter in to the 'unique, radical nature of the gospel': the reckless, spendthrift love of God. 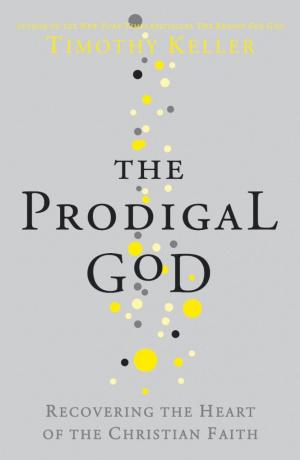 The Prodigal God by Timothy Keller was published by Hodder & Stoughton in October 2009 and is our 2228th best seller. The ISBN for The Prodigal God is 9780340979983. Tim Keller, New York Pastor and church planter, in a brief, but blockbuster of a book cuts the ground from under any claim that being Christian is being religious as popularly understood. The Parable of the Prodigal God (Like 15), told for and in the presence of the religious elite highlights two kinds of sinner: the first, the free-wheeling expressive experimentalist, the second, the kind who avoids sin so as to get to God. Both are are misdirected. In Chapter One Keller discusses the well known phenomenon of people who like Jesus but not the church and concludes that since Jesus' teaching consistently attracted the irreligious while offending the Bible-believing religious people of his day we all must conclude that since our preaching and living does not have the same effect our churches must be more full of Elder Brother types (religious/moral/rule keepers) than we have thought. His book is a powerful plea to let the Gospel cut across all our cultures, both religious and secular. Tim Keller is, of course not the first to point out that the title The Prodigal Son for Jesus' famous parable is not sound, but he is significant for preaching and writing (in an astonishing and disarmingly low key way)so as to connect extreme prodigality or lavish extravagance with the Welcoming Father. The Fathers's initiative, embrace and welcome is all inclusive. There is no privileged elite. All sin requires radical repentance (Keller attacks the old liberal idea that there is no need for atonement in the story). The Gospel of Jesus is not religion or irreligion, morality or immorality, moralism or relativism, conservatism or liberalism. Nor is it something halfway along a spectrum between two poles - It is something else altogether. (Chpt Redefining Sin) I am an Anglican Minister and when I read this book I immediately organised a 4 week course, sold a pile of these books, people read them eagerly and we had a wonderfully productive time. Then I saw the website of Redeemer Church and realised thousands of others had done the same. This is an interesting book; the author takes apart the parable of the prodigal son and shows how there are two sons in the parable and how these two sons are symbolic of different classes in our churches and in Christianity. He also develops the theme of how we come out of these groups and develop a really personal relationship with God and know the full love of Jesus’ sacrifice for us all. This book is simple to read for a new Christian, but really provokes thought in the more mature Christian as it has some challenging views on attitudes and the behaviour of Christians. Overall I found this book very readable, it is one I would recommend other Christians to read as it gives a new view on the parable of the prodigal son. Got a question? No problem! Just click here to ask us about The Prodigal God.